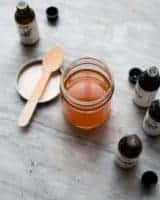 Gently heat coconut and olive oils in a glass measuring cup or jar in the microwave or place it in a small pan or simmering water. Add the ground ginger and cayenne. Let stand for 30-60 minutes in a warm place. Place the the beeswax into a measuring cup and set into a pan of simmering water. Allow to melt. Be careful as the wax will be very, very hot after it melts. Add the shea butter and stir until melted. Keep warm. Stir well. Remove from heat and let cool slightly before adding the essential oils. Stir gently until combined. Do not use on children because it could cause skin irritation. Test on a small area of skin before using. If rub creates extreme irritation, wash with water and soap. Wash hands well after applying and be careful not to get it onto mucous membranes. Do not use on broken or irritated skin.